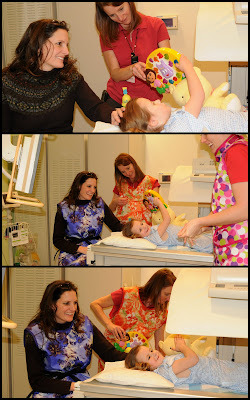 I truly love Primary Children's Hospital. I am very grateful that we have such wonderful child friendly facilities near by. Ivy had to have a test to see if she has kidney reflux. The test is a very invasive test and one that the hospital said we may have to reschedule and do it with sedation. I started preparing Ivy, letting her know that she was going to have a potty test- where they take lots of pictures of her. My mom talked to her about how I had the test when I was her same age. She didn't act nervous at all and was smiley the whole time. In the waiting room she played and giggled. When it was time to go back to the radiology department she remained all smiles. The nurses started to explain to Ivy what was going to happen. She jumped in and explained to them that she was going to have a "potty test" and that she wasn't worried about it. 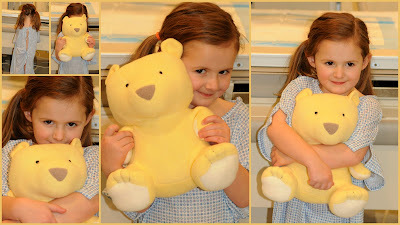 She got to hold her teddy bear the whole time they prepped her and the whole time she had her test. His name is "Dr. Bear E Ball". She loves cuddling with him. I loved her cute little body in the hospital gown. My mom took several pictures of her while they were performing the test. 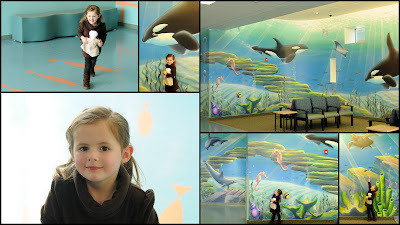 Afterwards, Ivy had a good time showing us the mural at Primary Children's and she showed us the fish that direct you down the halls to each department. You may wonder why I would take pictures during a hospital procedure. Picture taking means we're expecting to have a good time and make memories. 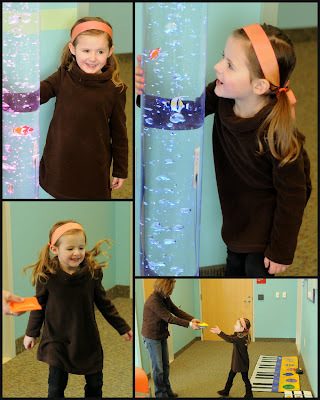 What better way to make a child feel comfortable then set the expectation of something being positive and fun? 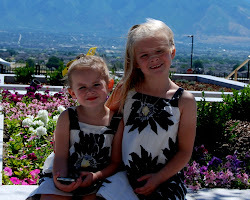 She did great and the best part about it is that she does NOT have kidney reflux. ivy was so brave!!! you made something scary into something fun a memorable! that's great!! i had kidney reflux when i was a kid and always had a special dr note to go potty whenever i needed to during school. it was awesome! What a brave little girl! And I'm so happy that you ended your day with good news. Ro- no wonder you and I were instant friends- we share the same medical condition. Although I had the surgery when I was 5 and I didn't get the doctor's note to go potty whenever I needed.